Cancer fighters June Stokes and Annie Urlich. Mrs Urlich lost her mum to breast cancer more than 30 years ago, stood by her husband during his eight-year battle and lost her best friend of 35 years to melanoma this year. 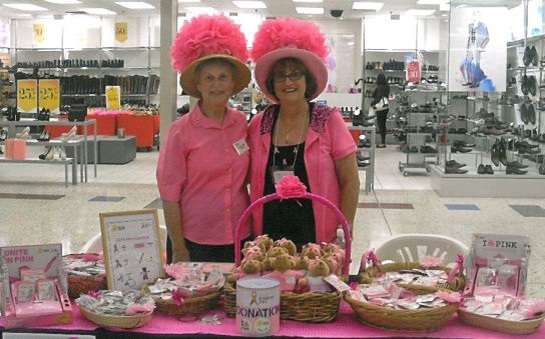 The 68-year-old has supported Pink Ribbon Day (October 26) and Daffodil Day (August 28) for 10 years by fundraising at Mirrabooka Shopping Centre. In that time she has raised more than $45,000. Mrs Urlich said after losing her mum she felt there needed to be more research to fight the disease. �The other most significant experience our family had with cancer, other than losing mum, was in 2008 when my husband was diagnosed with cancer and it set us on a rollercoaster ride of treatments, radical neck dissection and tube feeding,� she said. Mrs Urlich said it was extremely important for the community to support Cancer Council WA fundraisers as this was the most important way of obtaining monies for all the areas of research and the many areas of personal support given to the patients and their families. �Public support has always been shown every time our team of gals are out fundraising, especially on Daffodil Day and Pink Ribbon Day,� she said. Mrs Urlich will be at Mirrabooka Shopping Centre fundraising for Pink Ribbon Day on October 21 and 23.